There are backpacks, and then there are Mission Workshop backpacks — the difference becomes clear as soon as you sling one onto your shoulders. The San Francisco-based company is known for its high-end technical bags and apparel, building on the experience of two of its managers who previously co-founded Chrome Industries, maker of iconic messenger bags, and Massif, which provides apparel to the likes of NASA and the U.S. military. Mission Workshop gear feels like a combination of those two histories, like mil-spec for the street. The Radian travel pack is the latest — and largest — backpack to join the lineup, and we took one on a whirlwind adventure from Milan to Frankfurt and to Paris. It served as our sole bag and carried everything we needed for a week. Mission Workshop products are designed by hand and manufactured here the U.S. The build quality is as good as it gets, but the price is up there, too: The Radian starts at $585, but as tested with a camera insert and other optional accessories, our review model came to $815. If that number just gave you sticker shock, we don’t blame you — but as we alluded to above, this is no ordinary backpack. There are many things the Radian is, but there is one thing it most certainly is not: An impulse buy. If you’re going to blow just south of a grand on a bag, you better put some thought into the decision. This is a pack bought only after careful consideration, purchased for purpose, and held on to for life. Or at least, that’s how Mission Workshop wants you to look at it — we see no reason to disagree. While the apparent simplicity of the base Radian may seem to belie its high price — it’s essentially a 42-liter cavity with a clever roll top — it packs in plenty of tricks that don’t immediately meet the eye. A lightweight internal frame adds structure and helps distribute the weight when using the optional waist strap (not tested); an expandable mesh water bottle holder can be found in a zippered side pocket; on the opposite side, a discreet computer sleeve holds up to a 15.5-inch laptop; and a dedicated tablet sleeve can be found on the top of the bag. Whatever you plan to carry, the Radian will keep it safe from the elements. The main compartment can be accessed either from the front via a zippered lid that runs almost the entire length of the bag, or from the aforementioned roll top. The top can be closed either by a Velcro flap, a buckle strap, or both. The Velcro patches are large, which is good for security but bad for discretion as they make a lot of noise, so having the option to bypass the Velcro is welcome. The strap is unique in that both halves of it can be attached to multiple points on the bag, allowing you to use it to secure both the roll top and front-access lid, or just one or the other. Whatever you plan to carry, the Radian will keep it safe from the elements. The tough nylon exterior is treated to be water resistant, but even if you find yourself caught in a torrential downpour, the internal waterproof liner will ensure your gear stays dry without the need for a pullover rain cover. As part of an ecosystem, the Radian is joined by a host of accessories that are every bit as overbuilt as the bag itself. Our review unit came with the Arkiv Horizontal Zip pocket ($42) and Arkiv Mini Folio ($58), each of which is secured to the pack via four metal mounting brackets (excessive, perhaps, but very strong). The Radian uses the same mounting system — basically nylon rails sewn securely to the bag — as other Mission Workshop packs, so if you own multiple, you can easily swap your accessories from one to the next. Simply undo the velcro strap at the top of the rail, and the Arkiv accessories slide right on. As our primary goal was to use the Radian as a camera bag, ours also included the Capsule camera insert ($130). The Capsule is a padded compartment with various Velcro dividers that can be rearranged to accommodate a variety of camera and lens loadouts. It is also self-contained, with both top and front zippered covers and top and side grab handles. It doesn’t look big, but we fit a surprising amount of gear into it on an initial outing: a Fujifilm X-T2 with a 35mm f/1.4 attached, a Panasonic GH5S with a 12-60mm f/2.8-4, a Canon EOS 6D Mark II with a 24-105mm f/4, and two additional Fujifilm prime lenses. With the Capsule in place, remaining room in the Radian shrinks considerably. Fortunately, we didn’t need to bring all of that gear to Europe and were able to reallocate space within the Capsule to make room for other essentials. All told, we fit seven days’ worth of clothes, the Fujifilm X-T2 and two lenses, a FeiyuTech A2000 gimbal, a MacBook Air, two smartphones, headphones, and various power adapters and chargers into the bag. The weight? A grand total of 27 pounds. While it could have been worse, that is one of the dangers of large backpacks — if you’re taking full advantage of their size, they’re going to be heavy. Fortunately, the Radian does its best to make that weight manageable. Despite its size, the pack is surprisingly comfortable to wear. The straps are snug with just the right amount of padding, and the Velcro harness that secures them can be readjusted to different positions to fit various body heights. The bag feels practically molded to the contour of your back so that it stays in place as you walk. In hindsight, though, we should have opted for the Expedition Waist Belt ($79) for additional support. Despite its size, the pack is surprisingly comfortable to wear. All of that said, there’s no getting around the fact that carrying that much weight on your back will eventually wear you down. For many people, a two-bag solution is going to be the preferable method, and we definitely would have preferred that at times. There were also times, however, when the simplicity of traveling with a single bag was helpful, such as going through airport security or navigating a crowded train station. At 26.5 inches tall with the roll top extended, one concern we had was whether the Radian would actually fit within the carry-on size limitations of our various flights. Fortunately, we had no trouble here. We did gate-check the bag on a regional flight (which proved unnecessary) and simply removed the Capsule beforehand to keep our most important gear with us. Without some sort of shoulder strap, the camera insert isn’t exactly great to carry around on its own, but it worked well in this instance when it was just getting tossed under a seat. When checking the bag, the Radian even has a cover that zips around the back panel to keep the shoulder straps safely stowed away. To say we were impressed with the Radian is an understatement, but there’s no way around the fact that this is an expensive bag. Even if the high quality materials and craftsmanship make it worth it, spending between $585 and $1,000 on a backpack simply isn’t an option for many people. If you’re in the market for a hybrid roll top backpack and don’t need the capacity of the Radian, you can pick up the 31-liter Wandrd Prvke with a camera insert for just over $250 (we tested the 21-liter version and quite liked it). 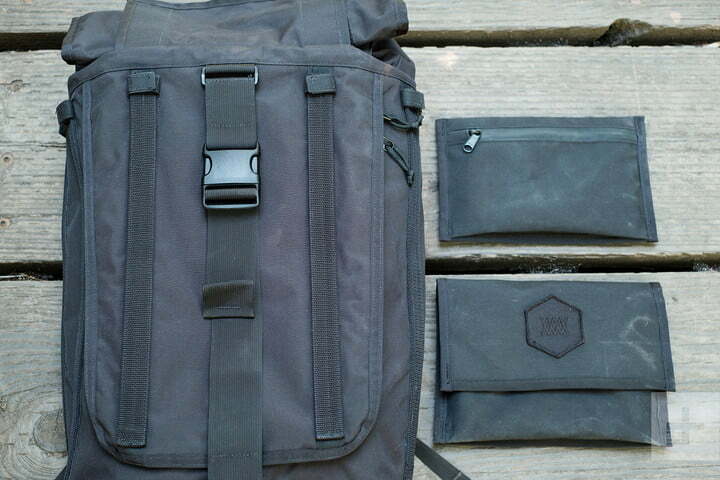 But there are backpacks, and then there are Mission Workshop backpacks. 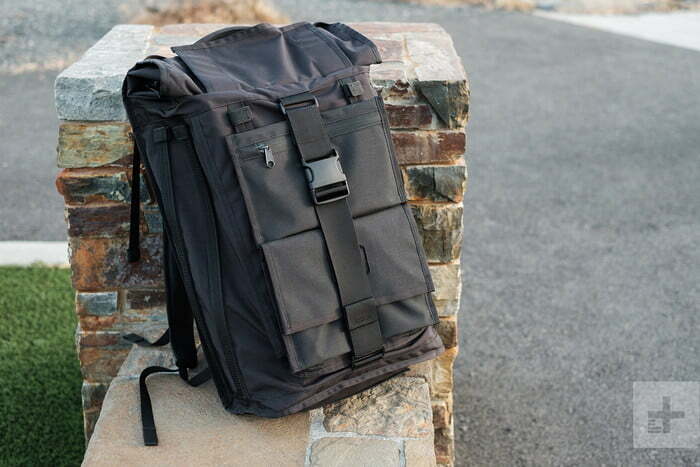 The Radian is a no compromise bag that combines maximum capacity, durability, and flexibility. Being able to just yank out the camera insert at a moment’s notice and convert the bag from a carry-on to checked luggage is certainly useful. And while we didn’t encounter any inclement weather on our adventure, if you plan on traveling to a region of the world where freak rainstorms are common, you will definitely appreciate the pack’s inherent weatherproofing. As long as you don’t mind getting a workout, the Radian will handle anything you throw at it.